Ruby is the beautiful birthstone of July. Ruby is what is known as a precious stone and has been very highly valued throughout history. It is known as the king of precious stones. In this blog post we cover the formation of Ruby, it's history, properties and of course it's use in jewellery design. Colour: Rubies vary from deep shades of red to dark pink. Chromium is what gives the ruby it's rich red colour and it also causes red fluorescence which further enhances its colour. The most desirable colour of ruby is known as 'pigeons blood', which is pure red with a hint of blue. Appearance: Inclusions are common, however they do not decrease the value of the stone, instead they help to determine the natural gemstones to the synthetic ones. 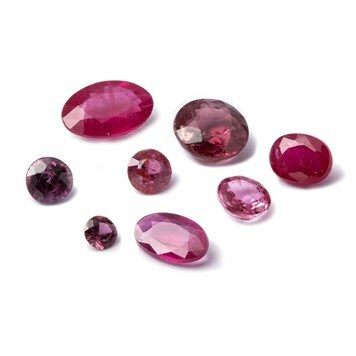 As a rough stone ruby appears dull and 'greasy', but when cut, it has great luster. Ruby has a trigonal crystal structure and many occur as a tabular shape (flat - tale like). Rarity: Rubies are a little rarer than sapphires. There is no shortage of small ruby gemstones, however, large rubies with a high carat are much more rare. MOH's Scale Hardness: Ruby measures 9 on the hardness sale. It is the hardest mineral after diamond. It is 7x harder than Topaz, which is next on the hardness scale. A rubies hardness varies in different directions. Sourced: India, Madagascar, Russia, Sri-Lanka, Cambodia, Kenya and Mexico. Ruby is a variety of the mineral corundum - this is the same mineral as sapphire. Pure corundum is colourless and the colours of corundum are caused by small amounts of chemical impurities. Chromium gives the rich red of ruby. Sapphire is the name given to all the other gem corundum (but most closely associated with the colour blue). The host rock of ruby is mainly a dolomite type marble which has been formed from limestone by contact caused by heat or pressure from granite. The Mogok area of Myanmar has produced fine rubies for many centuries. The finest stones with the deepest of reds are often described as 'pigeons blood'. A few are mined from marble, but most are recovered from river gravels. Ruby is one of the most expensive gems, large rubies being rarer than comparable diamonds. Some gems that were thought to have been rubies throughout history have turned out to be spinels. The name ruby comes from the latin word Rebeus which means red. It was not until the 1800s that ruby (as well as sapphire) was discovered to belong to the corundum group. Before that date red spinel and garnet were also called ruby. Myths of ancient times include that the wearer of a ruby was blessed with health, wealth, wisdom and outstanding success in heart affairs. In Burma, legend tells that all rubies in the world come from an egg laid by the dragon naga. Ruby was also said to be the most precious of the 12 stones created by god when he created all things. It says in the bible, "wisdom is more important than rubies" - showing how valued it has been for so many years. Ruby is said to be an excellent stone for energy, however it may sometimes overstimulate in delicate and irritable people. Ruby is believed to encourage passion for life but never in a self-destructive way. It is said to improve motivation and setting realistic goals. In terms of chakras, ruby stimulates the heart chakra, helping to balance and encourage you to follow your bliss. It is believed that ruby promotes positive dreams and clear visualisation as well as aid in retaining wealth and passion. Ruby is also said to encourage the removal of anything negative from your path and promote dynamic leadership. 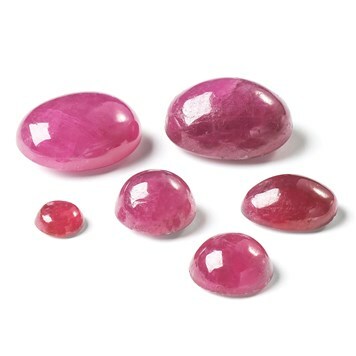 Emotionally, ruby is believed to charge up passion. It is a sociable stone that attracts sexual activity. Physically, ruby is said to help overcome exhaustion whilst being able to calm hyperactivity. Rubies are often used in crystal healing. They are said to detoxify the body, blood and lymph as well as treat fevers, infectious disease, and restricted blood flow. Rubies have been used in jewellery for centuries and have long been associated with wealth and royalty. Queen Elizebeth's ruby earrings, and v-shaped ruby and diamond bandeau collar are a famous example of rubies used in royal jewellery. Many of the rubies available on the accessible jewellery making market today are of small sizes. Sourcing larger rubies becomes very expensive. Rubies are great for jewellery making as they are so strong. They can take high temperatures and therefore can be incorporated into many different settings. Below is a selection of our ruby stones and some design ideas for incorporating them into a beautiful piece of jewellery. You can view all of rubies for jewellery making here. 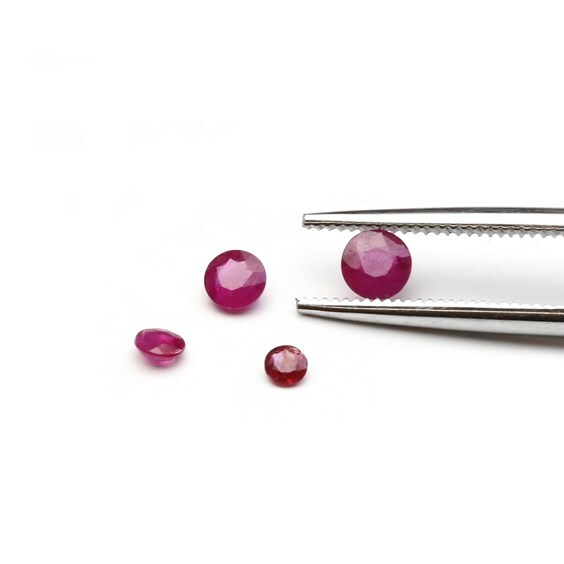 Our beautiful, high quality ruby cabochons come in 4 different sizes, two round shapes at 3mm and 5mm and two oval shapes at 6x4mm and 8x6mm. We supply calibrated cabochon stone settings in all of these sizes meaning there are many easy and quick ways to create an array of designs. For example create beautiful yet simple stud earrings by using devon glue to secure your choice of ruby cabochon into our sterling silver milled edge settings. These equally gorgeous, high quality ruby faceted stones come in six different sizes meaning there are plenty of design options. For example combine them with other stones such as diamonds to create a high end design perfect for a special occasion. Or for another quick, easy yet stunning design, combine with our sterling silver snaptite settings for a pair of sparkly studs. For step by step instruction on how to create this look click here. 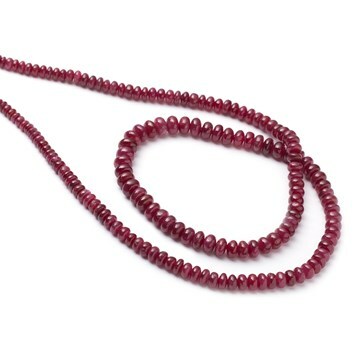 These delicate genuine ruby beads are truly beautiful. 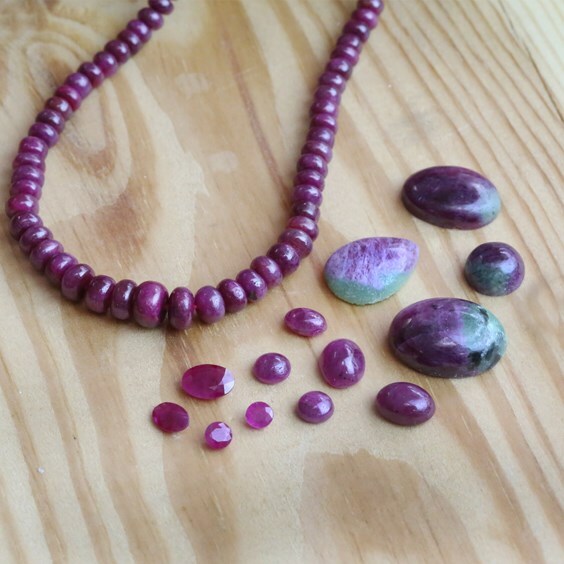 They have a lovely rich pink colour making them striking enough to be worn alone but are also a perfect tone to combine with other gemstone beads and precious findings. These beads featured in our DIY friendship bracelet blog post, which is the perfect little gift for a friend with a birthday in July.